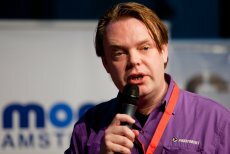 On Monday, June 7th, Mobile Monday Amsterdam will organize MoMoAms #16: The Mobile Distribution Game. It is time to share the line-up and the release date for the RSVPs! Read on to find out who will be on stage and when you can grab your RSVP. Why the Mobile Distribution Game? Simple: The mobile space is very fragmented. Since Microsoft released its mobile OS to compete with the Palm OS 10 years ago mobile developers have strugled to support multiple mobile platforms, each with a relatively small user base and a large developer learning curve. Because of this mobile content distribution is a hard game to enter. We’ve got some of the best players in the game sharing their knowledge at our next event. Something tells me this is going to be AWESOME. How do I reserve a ticket ?